When we tell you that these Kingpin folding chairs are big, we mean it--at 31 in. wide x 38 in. deep x 66 in. 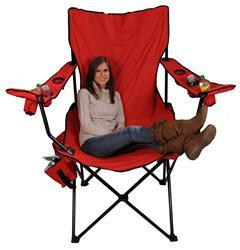 tall, the Kingpin folding chair eats ordinary camp chairs for breakfast! The reinforced powdercoated steel frame and UV/water-resistant canvas construction can easily hold two adults (up to 400 lbs. total), but it still folds up to 8 1/2 in. wide x 8 1/2 in deep x 66 in. tall and stores in the included carrying bag. Six mesh cup holders and a removable 12-can cooler ensure that the King will never be caught looking for a beverage. Thank you for your question. The Summit Gifts 7002 weighs 27 pounds. Have "friends" who think they are KING (or QUEEN) of all? Get this Throne and put those self want to be's in their place!!! Fun and comfortable. Height "impaired" may need a step stool to mount and dethrone!!! This chair is a head turner. I sometimes sit in this chair in my garage and when they drive by and see me sitting there they give me the thumbs up. I'm 6'2", 270 and it's nice to have a chair that makes me feel small. I unveiled it at my tailgate party and everyone loved it. Looking forward to getting a second one. They are very cool! Nice fabric and the carrying case is nice too! This chair is huge. I was a little leery of ordering something of a novelty but it is great quality, stronger and more well made than most folding chairs and a real attention getter. Am ordering a second one. I’m 6’10” and 335lbs and I feel like a kid in this chair. We looked for one for awhile and this is the one we wanted very happy .